The Gardner family built several mills. An early one, on South River in Salem, was built by Samuel and John, sons of Thomas and Margaret. The permission for the mill was granted in 1663 (pg 85, 1907 book of Dr. Frank). About 1743, the Gardner mill was still in operation. One of the owners was John Gardner (#90, 1907 book) who was a descendant of George, also son of Thomas. At that time, John erected a tide mill at Forest River. John's son sold the mill. There were a couple of interim owners; the mill was later purchased by an in-law, Francis Peabody. John Goff, Salem Preservationist and author, recently wrote an article (Salem Gazette) about a millstone (photo) found in the Forest River area this summer. John, who is a Thomas and Margaret descendant and who has contributed to Gardner's Beacon, sent us photos. There were several tide mills in Salem (John Goff, Tide Mill tours in and around Salem). 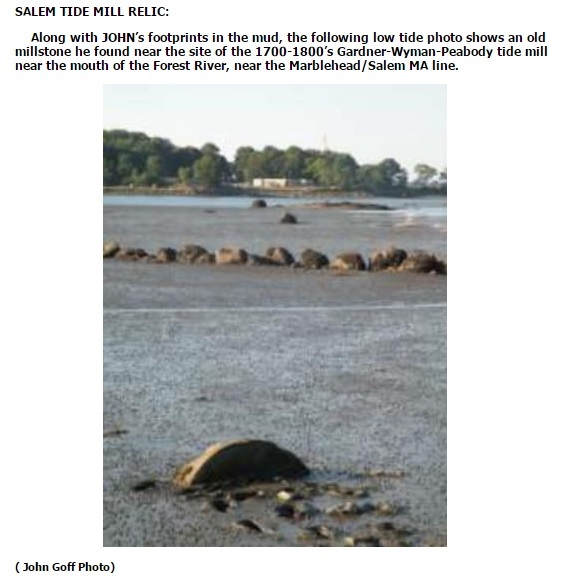 The Tide Mill Times published the photo by John of the millstone in their "2016 Summer" issue. In that same issue, there is an article about specifics of tide mill design and operation. The first part of John's article appeared recently: When Forest River Tide Mill made corn meal (Part 1 of 2). Part 2 of John's article will cover modernization of the mill that converted it to paint production. John, son of John Gardner who was the mill's builder, married Elizabeth Pickering, sister of the noted Colonel Timothy. Their son, Samuel Pickering Gardner, went off to that wider world of Boston as did Winthrop, much earlier. Samuel married Rebecca Russell Lowell, daughter of the Judge. Samuel's and Rebecca's son, John Lowell Gardner I, married Catherine Peabody who was the sister of Francis Peabody who bought, and modernized, the mill. Finally, the son, John Lowell Gardner II, of John and Catherine married Isabella Stewart whose name adorns the Boston museum. In the article, John notes that Ingalls and Wyman owned the mill between the Gardner and Peabody. In his 1933 book, Dr. Frank mentions that John Gardner had sold the mill in 1786 to Captain Samuel Tucker.